the story of the brewery which was founded in 1867 by Susannah Oland. 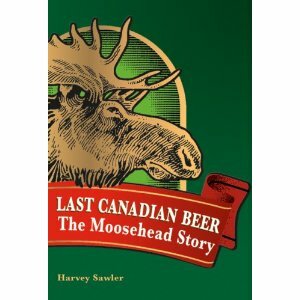 "Moosehead Breweries and its long-time owner, the Oland family, is the last of the independent Canadian beer companies. From the moment in 1867 when family matriarch Susannah Oland began brewing beer in her Dartmouth, Nova Scotia, backyard, the Oland name has been synonymous with Maritime beer and, perhaps more importantly, successful family business. Last Canadian Beer is the story of the Oland family's long tenure running one of Canada's most popular breweries in the face of increasing pressure from international brew giants. While other beer brands have sold out to American and European interests, Moosehead has remained fiercely independent. The author sets out to answer three primary questions: Who are the Olands? ; What has made them successful? ; and How will the Olands continue to keep Moosehead as an independently owned family business?" Although much of the book details the last 20 years of the company, it also gives a quick and interesting history of it's early years where the company had to survive fires, the Halifax Explosion, family battles and how it came to settle in Saint John New Brunswick, after being founded in Halifax Nova Scotia. The brewery is still in Oland hands as the 6th generation Oland, Andrew, is now in charge. The book is a light entertaining read, which at times sounds like it is a cheerleader for the company. More could have been written on the family split-up, which really was just touched on as it was a huge moment in the companies history. It is very insightful as to how other beers are being promoted in Canada, which turns out to be a plus for Moosehead. Also interesting was Mooseheads realization that the East Coast beer market was not growing and their decision to expand first into the competitive US market instead of across Canada due to inter-provincial beer regulations. Now 40% of the beer they sell are sold to Americans and they can afford to now move slowly across Canada. This is a little slice of Canadian history, and is worth a read. Not true - Brick Brewing is also Canadian owned and operated. Brick is the 4th largest brewer in Ontario and the 5th largest brewer in Canaada. My description was in reference to macro breweries. Brick does make many fine beers but my understanding is that as they are still considered a regional craft brewery as they produce under 300,000 hectolitres of beer each year. This is good for brick as it means they still qualify for grants from the Ontario Craft Brewers Opportunity Fund. Hopefully, with brick being a publicly traded company, they remain Canadian. If you haven't returned it to the library, I wouldn't mind reading it too.